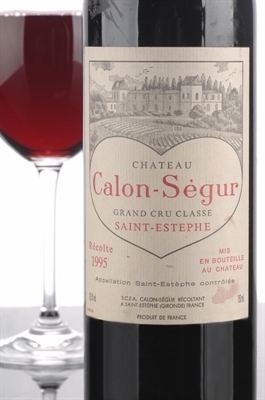 As I have said many times since I first tasted this wine, the 1995 Calon-Segur is one of the great sleepers of the vintage (I bought the wine as a future for a mere $250 a case). The wine has closed down completely since bottling, but it is a sensational effort that may ultimately merit an even higher score. The wine is opaque purple-colored. With coaxing, the tight aromatics reveal some weedy cassis intertwined with truffles, chocolate, and beef blood-like aromas. On the palate, there is an element of sur-maturite (1995 was an extremely late harvest at Calon-Segur), fabulous density and purity, and a boatload of tannin. This deep, broodingly backward, classic Bordeaux will require a decade of cellaring. Proprietor Madame Gasqueton (one of The Wine Advocate's heroines of 1997) has produced two unqualified back to back successes. Kudos to Calon-Segur, as both the 1995 and 1996 wines have a strong buy recommendation from me, but only for readers who have the patience to wait them out.